Within every segment of collectible vehicles, there’s a very small subset of “holy grail” models at the apex of their respective food chains. For Italian exotics, it’s the Ferrari 250. Jags have the D-Type. The ’71 Hemi ‘Cuda convertible tops the muscle car market. 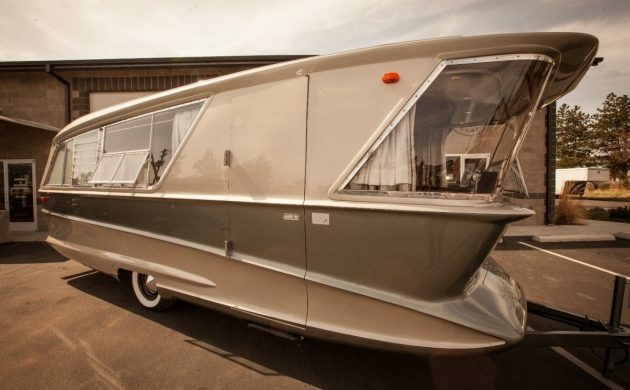 And while most would likely expect an Airstream to top the vintage camping trailer segment, I would bestow that honor on this extremely rare gem. 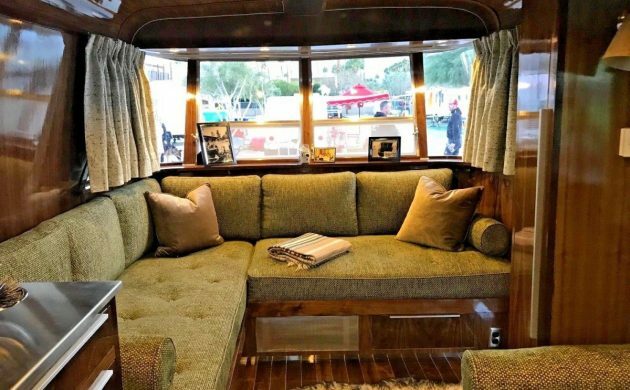 This 1961 Holiday House Geographic trailer (one of seven built) is located in Bend, Oregon and is listed here on eBay with an asking price of $225,000. Holiday House was a brand started by David Holmes, President of “Harry & David” fruit company, and began producing travel trailers in 1959. Rumor was he started building them as much of his staff had little to do in winter when no fruit was growing. Several models were built up through 1962 when the factory was destroyed in a fire. And while they are all highly collectible, the Geographic was like nothing else. They were designed by Chuck Pelly, designer of the Scarab race car and founder of Designworks USA, BMW’s California Studio. 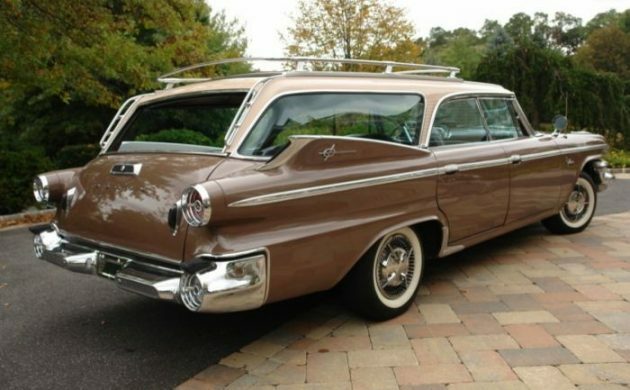 Only seven of these were thought to have been built – not surprising as they carried a price tag of $8,500 (more than three times the price of an average new car in 1961). Of the seven, this is one of two known survivors. 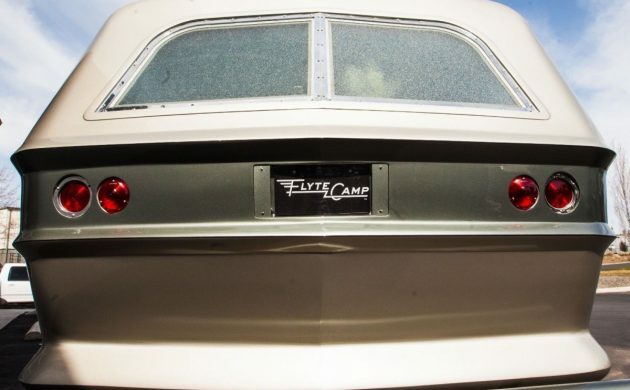 Renovation work was done by Flyte Camp, a well-known high-end shop known for the reality TV show Flippin’ RVs. I would term this a renovation rather than a restoration, as modern features and comforts have been added – basically a restomod. The stunning interior includes black walnut hardwood flooring and cabinets with custom aluminum detailing. Countertops are Marmoleum and stainless. Modern plumbing and electrics have been added including entertainment systems and LED lighting. Clearly not what you’re going to drag up to the mountains for a fun weekend in the mud. The dark woods give the interior an almost nautical appearance. This would not have been out of place at the 1964 World’s Fair or part of a Disneyland Tomorrowland exhibit. 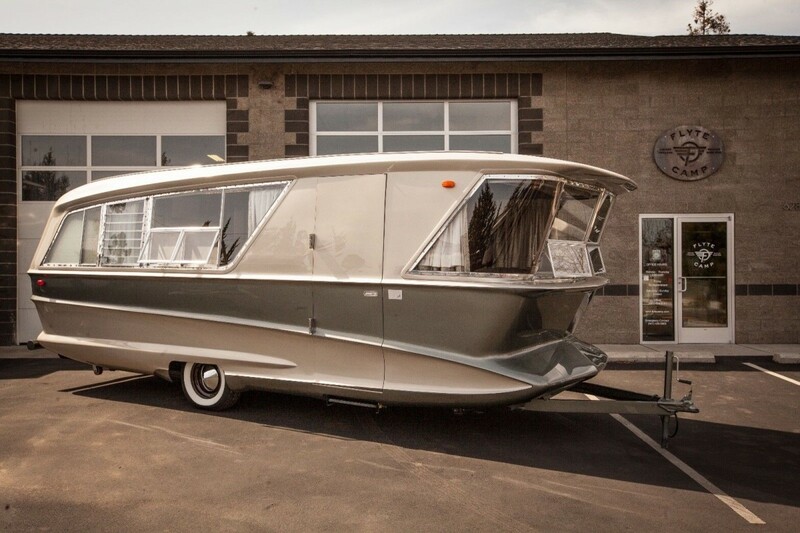 Considering the high price of modern RVs (luxury bus-chassis coaches can easily top $1 million), the asking price of this rolling fiberglass slice of Americana is put in perspective. Restored GM’s Futureliners easily sell for seven figures at auction, and there were a whole 12 of those produced. Do you see this rare beauty reaching that rarefied air? Wow….Wow…Wow this trailer is amazing. This is way out of my league but that doesn’t mean I can’t have an envy attack.im a big fan of dark wood so this hits all kinds of button. The out side is also very stylish, the aerodynamics up front is a little backwards but that’s ok. Really the only thing to pull this trailer would be a big 1961 caddy or imperial. I’ll pick up my jaw now and move on to another post. Yeah, we did a lot of camping when I was a kid. Never heard of this, or “Flippin’ RV’s”, for that matter. ( sounds like yet another show to over inflate the price of vintage campers) Belongs in a museum. I’d be afraid to pull this, and for a quarter mil, I’m sure some spoiled br–,,oops, I mean, some enterprising person that just happened to come into a lot of money, will have to have this. They’ll pull it out to Burning Man and sell/trade grill cheese sandwiches out of it, dad will deduct the operating costs on his business account. At the end of Burning Man, you can tow home what’s left of this after the masses have trashed it during their week-long bender. Howard you old gear jammer if you never heard or seen them they had to be rare.Respects. Wonder what the original interior would have looked like? Not very different. The wood wasn’t quite as nice, the appliances were super high tech for the era, but janky and unreliable by modern standards. 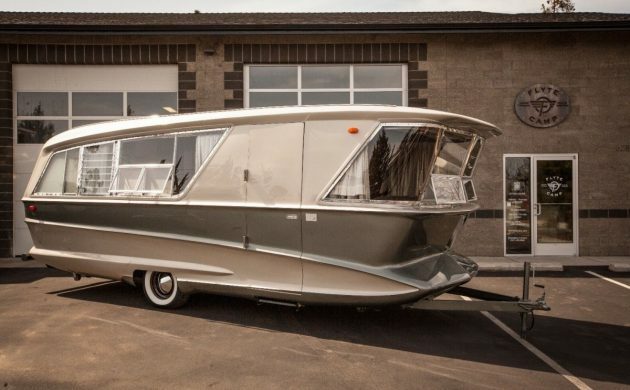 These were high end trailers, to be sure, but they were also a model from a company with serialized production, like a Cadillac, so they weren’t supposed to be super custom on a par with Rolls Royce or Daimler. This will end up in the high end glamping week in Marfa known as El Cosmico. And I bet people would even pay $2 and line up to walk thru it. Beautiful trailer. This would fit right in with modernism week which takes place in February here in Palm Springs, CA. 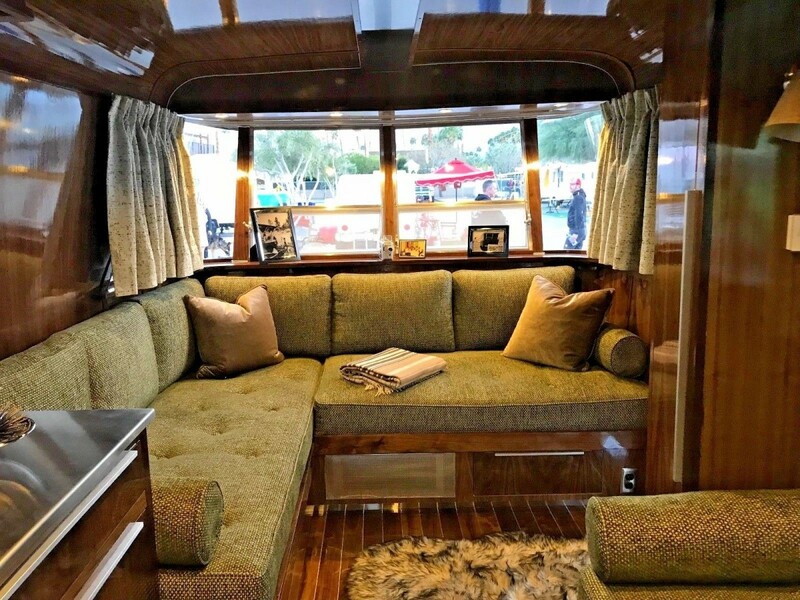 “The icing on the cake was having Chuck Pelly attended the Palm Springs Modernism event in February of this year to see the completed Geographic, and he added his personal signature to the trailer both inside and out! This thing is cooler than the bottom side of the pillow!!! I’ve never seen one like it. The interior may be just a tad too modern for this vintage but, it looks good. And no offense to anyone, but if I had $220K to spend traveling, it wouldn’t likely be on a trailer. Marmoleum is a jute-backed pine rosin and linseed oil based product that does very poorly in wet environments. Interesting choice for a bathroom counter and floor. 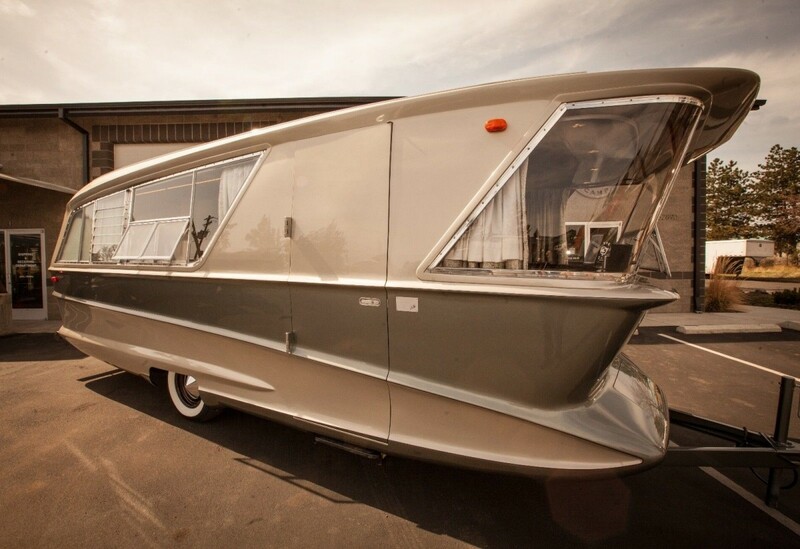 Beautiful trailer, that one detail stood out as an odd choice and will keep from bidding. Well, that and the price. Plus which, I don’t like the view of the toilet from the front of the trailer. That front window doesn’t show any curtains, etc. Embarrassing!! Close the door and pull the shades, if available, I guess. What a beautiful camper, I don’t believe is anything else out there that’s even close. 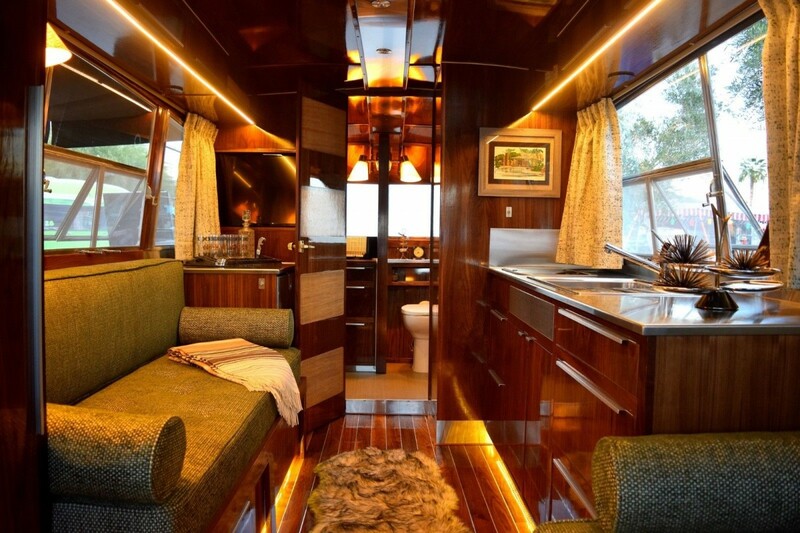 The restoration/upgrades surely make the inside beautiful and very functional for today’s types of camping. However, I’m not sure who in their right mind whatever tow this around, you’d be afraid it could get scraped up or stone chips. Of course, finding an appropriate tow vehicle would also be something that would be difficult and expensive. It’s certainly not something that you would tour around behind in modern-day pickup truck (even the $45,000 1993 one that was on here a few days ago). It’s going to take a classic Lincoln or Cadillac of the same era to tow it around and look appropriate! You’re right. Towed by anything newer than about 1970, it’s going to look like you’re taking it somewhere to sell, not taking it someplace to use. If somebody ever would. I’d be most concerned about a blowout, especially with it being such a large single axle trailer – that is a lot of weight on two small tires. That could get out of control in an instant blowing out at freeway speeds. In 1961, $8500 would have bought a working man a decent house. In 2018, it takes $225,000 to buy a working man a decent house, at least around here. So I’d say the price is fair. 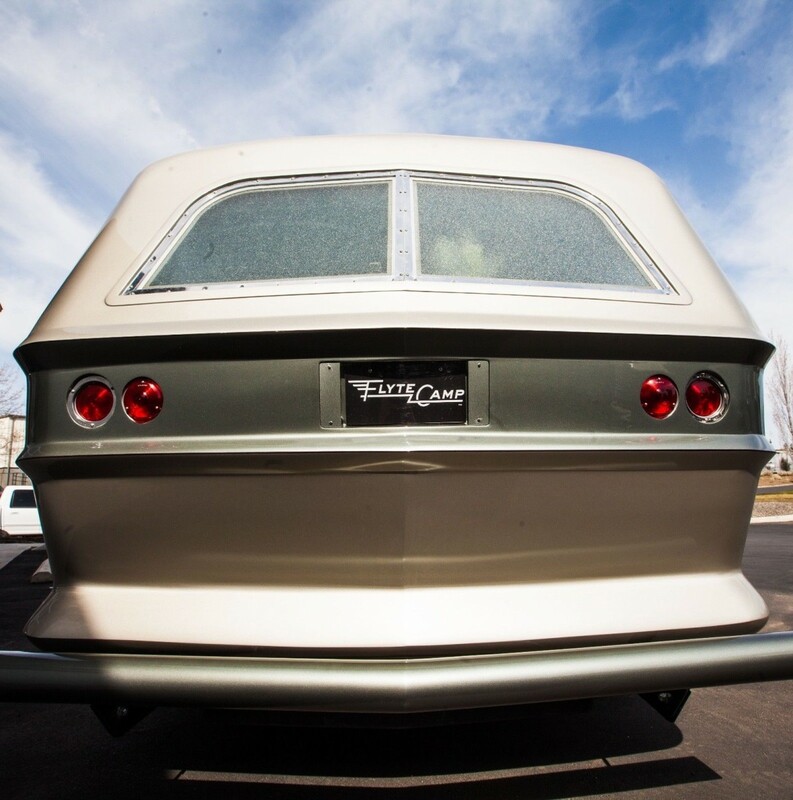 It’d look kewl parked in the back 40 near the fishin pond.Beer and bluegill,hard to beat. Would look good behind a nice Country Squire. I’ve seen some cool stuff over the years here but dang, that is probably the coolest thing on 2 wheels. This would look right at home on an episode of “The Jetsons”. Wow! Never heard of these but wow. Bend is about 3 hours away. Almost tempted to take a road trip to see it. Bid on it? Ya, no. Outta my league. It does have almost a nautical look to it, especially in the first pic of this article. Had to look at the others to see but in the first pic it almost looks pointed like the bow of a ship. Great find. This seems as if it should end up in a Transportation museum. Where do you sleep? $225,000 would buy a lot of nights in some swanky resorts. 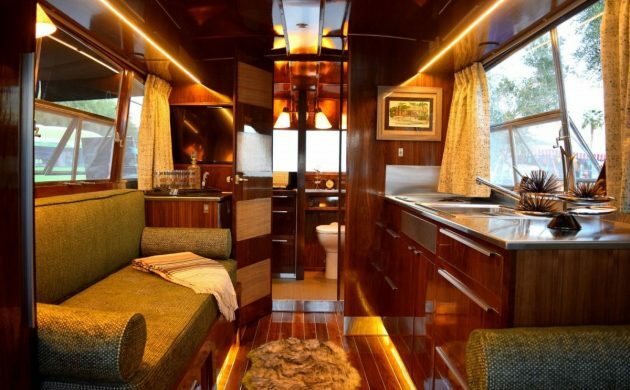 Seriously, this is one beautiful trailer…just think of how swanky a man-cave this would be. And when your wife learns how much it cost, you can run and hide in luxury! Infeild at the track. L I V I N.
Yes, it is a beauty for sure, even more impressive in real life. I had the pleasure of viewing this when we were in attendance at the vintage trailer rally in Pismo Beach, CA this last May. Wonderful workmanship but I would not call it a camper. Way too elaborate for that!! The Scribners of Flyte Camp are fine folk as well as their crew. Pismo has a vintage trailer rally?? Every May or just this year? I’ve lived in this area for almost 30 years and this is the first I’ve heard of it! We have a marmoleum floor in our kitchen. It’s a common flooring choice, similar to linoleum. The seams have to be sealed to keep the underlayment dry from spills and moping. The flooring company found that out the hard way! George Jetson all the way! That thing is outstanding! Fantastic design! The finish on the woodwork is spot on but the fit on much of it is poor…..for $225k it should be far better then it is. Would love to have seen it when it was new. A badass cab over truck set up for a 5th wheel tow! Designs of the late ’50s – early ’70s… puts stuff today to shame. We need to put wet bars back into designer’s studios. Only two things I pull an RV for, a big comfortable bed and a full size shower. I don’t see either one, so for me this is a total pass. Oh, and where is the A/C? Nice piece of art, but can’t imagine that price. Tow? This is one trailer that would go somewhere inside of another trailer. This beauty will NEVER see the road again. Some Fat Cat will buy it, build a cover over it, and use it as a ” guest house ” on his manses grounds. Lovely looking trailer. I’ve never seen one before. It looks like a small house on wheels. Have we forgotten the purpose of this feed? It is called BARN FINDS!!!! Yes, interesting trailer. NOT A BARN FIND! I think you will find that a lot of subscribers are here because they want to see BARN FINDS. 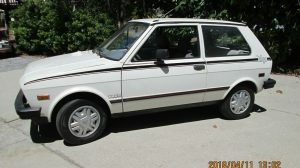 I’m here because I am always looking for interesting cars to purchase and rebuild, including BARN FINDS. 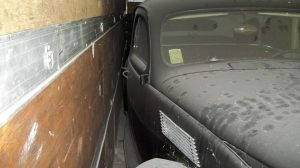 Leave articles like this about an expensive, obscure, restored vintage trailer that was NEVER A BARN FIND to the other feeds, like Jalopnik or Hemmings. This is not what you do and it is not why I’m here. On the other hand, Skippy, this has generated some entertaining comments and lots of interest. It’s old, it’s transportation-related, it’s uber-rare, and it’s just flat cool. 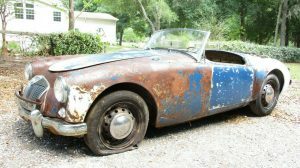 Plus, when they do feature actual Barn Finds, mostly what we get here is the same old comments that the vehicle is “junk” “not worth restoring” “crush it” and the like. So, there is that. Oh, and I’m sorry that someone pissed in your oatmeal this morning. That wasn’t very nice. Well, CycleMikey, you’ve got a point. I suppose the analogy is a lot like Burlington’s coat factory. If you’ve ever been in one you know that there is a LOT of crap in that place and you have to look really, really hard to find something that you might actually want to purchase. Barn Finds is like Burlington in reverse. 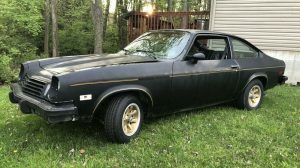 They list a lot of interesting stuff that is way overpriced, not a barn find or gone by the time you click on the link. If you are actually looking to buy cars, you have to sift through to find things you might actually want to buy. In the end, I would rather sift through the interesting, overpriced stuff than the true schlock stuff I find when using “searchcraigslist”. And, of course, there are a lot of poeple looking on BF that aren’t actually trying to buy things. For those folks, I also recommend the Hemmings feed and Jalopnik. Do what your handle says, Skip it ! Look at what you appreciate, and let the rest of us check out what we find interesting. Or… you can just leave. I’m here to see interesting things. I generally prefer to drive an RV rather than trailer it. (Owner of a 92 AeroCruiser motor-home. Look it up.) For this one I will make an exception. Got to find me a 61 Studebaker pick up with Auto and Air to pull it. That is not even close to being anything like the featured camper. The featured camper is very cool and belongs in museum. Not even close to being the same thing. I’m not even sure how they can call the classic. 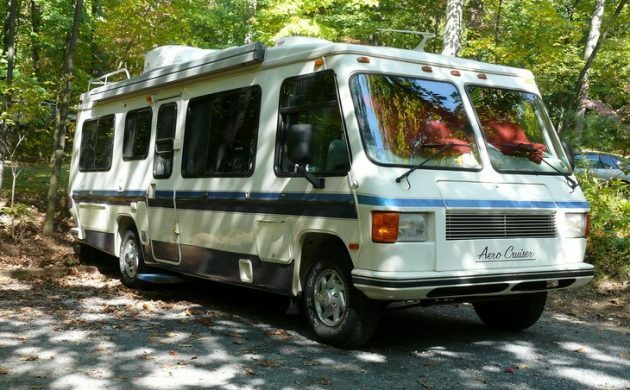 The only major difference between it and the new camper is the curved window on the front. Of course it’s about $200,000 cheaper than the one in this article so that is an advantage. One of the commenters here has that cool blue car/boat rig he built. Cant remeber who now. I’d like to see that hooked up to this thing! For 225000, I can rough it at the Ritz Carleton for long time. Those curves and shapes have Jetsons written all over it! I’m not an RV guy but would you restomod a Ferrari 250, a Jag D-Type or a ’71 Hemi ‘Cuda convertible? Don’t think so. of a “the incredibles” movie! Why didn’t the Brady Bunch have one of these or two? I hope the wheel bearings didn’t get over looked? I wonder if the other five of these that no longer are still around, were in single axle related accidents? Someone else here mentioned hauling this inside a new larger trailer only. I agree, then dragging it out at your destination camp site. I now want to build double axle trailer/party boats that look just like this, plus build more of these on 2 axles. The Brady’s would never have had anything that old. After all, they had new cars every season, er year. 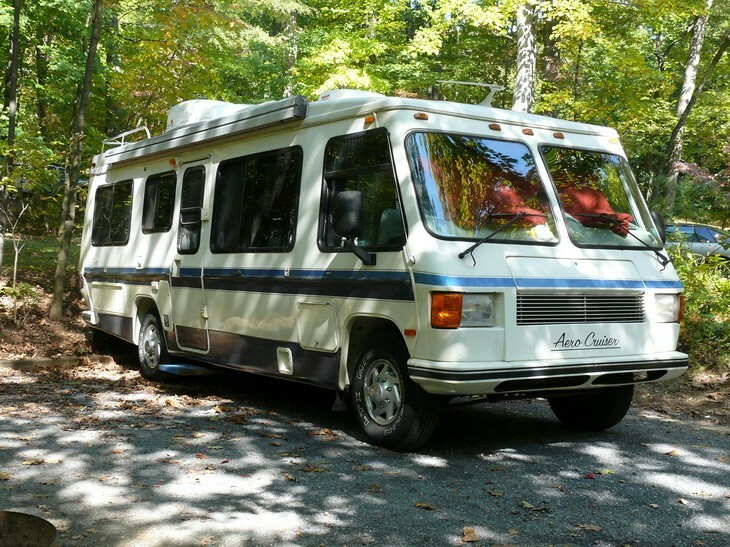 We’ve been RVing for 30 years and love the looks of this one. Michael it took top prize at Modernism right after it was built. I worked for FC and was involved with the design, build, and install of all the woodwork.